I posted a little while ago in this thread about my new beeb which had had some suspect work done on it, and now no longer has a PSU. I went ahead and ordered a Meanwell 65A, which (after way too long!) finally arrived, and I'm ready to install it. I've read through the excellent instructions for installing this PSU into a Master here, but obviously my unit is a model B and not a Master, so there are some differences. I have done a few electronics projects before (hooking up car stereos, building PCs etc), and it seems pretty obvious what steps I need to change, but I'm by no means an expert and I wonder if I could get some advice/confirmation before I accidentally blow something up? * The first most obvious difference is that ground to the motherboard on the model B connects to the power supply housing rather than the ground pin on the PSU as it does on the Master. Is there anything I need to keep in mind here, given this ground goes straight to the mains rather than the COM port? * Secondly, as you'll see in the attached picture, some of the 5V wires wrap around ceramic rings. I've seen these things before, but I have to confess I have no idea what they are or what they do. Can I safely just get rid of them? Other than than, are there any other things I should look out for that may not be obvious to someone doing this for the first time? Those ceramic rings will be ferrite rings used in an attempt to cut down on interference on the power lines. My beebs don't have them. The photo does not show any black (0v) wires. These will need connecting to the motherboard as well as the red wires. Don't forget the -5v wire too. Earth connects to the metal frame of my Beeb PSUs as well. I assume you mean 65W not 65A(mps)! Otherwise you Beeb is drawing the same as 2 Electric ovens on maximum. First, the ceramic rings. As said above, these are ferrite rings that have been coated/covered. They are used for noise/Interface suppression. As you will be connecting a switch mode power supply (SMPSU) to the Beeb motherboard via short wires, I don’t see that they would be very useful or effective. And that is assuming that you could fine enough space for them. So I recommend removing them. Note that in this section, earth/ground refers to the safety electrical connections to the metalwork and to the ‘earth’ or ‘ground’ connection to the electrical outlets/plug/socket. The mains flex (cable) should be a three core type. If the Meanwell SMPSU has a proper earth/ground terminal, wire the green/yellow earth wire to this terminal. Also take two other wires (coloured green/yellow) from this terminal. One goes to the metalwork of the Beeb’s power supply casing. The other wire goes to the 0V/ground output terminal of the Meanwell SMPSU. To ensure a good electrical connection, twist the stands of all three cables together (to make one ‘wire’) before cutting the copper to the correct length for the terminal. If the Meanwell SMPSU does not have a suitable proper earth/ground terminal where three wires can be connected, then a suitable threaded nut and bolt arrangement should be used on the metalwork of the Beeb’s power supply casing. I recommend either round eyelet crimp terminals (fitted with a ratchet type crimping tool) or round eyelet solder tags. To this point connect the green/yellow wire from the mains flex, a green/yellow cable going to a earth/ground point on the Meanwell SMPSU, and a green/yellow cable that goes to the 0V/ground output terminal of the Meanwell SMPSU. All mains and earth wiring should be rated at 3A minimum. The BBC motherboard requires two supply voltages. +5V and -5V. Plus a 0V/ground connection. Note that in this section, 0V/ground refers to the common (return) connections / terminals / wiring on the DC side of the SMPSU. Conventional current flow goes out from the +5V wiring to the load (the motherboard circuitry) and returns via the 0V/ground wiring to the SMPSU. For the negative supply, the -5V output, conventional current flows out via the 0V/ground wiring and comes back to the SMPSU -5V terminal. 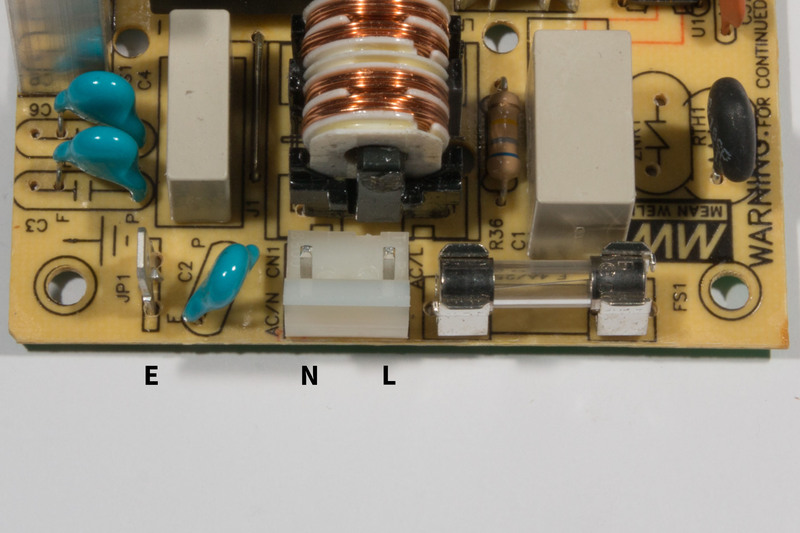 On most (U.K.) BBC computer motherboards, there are THREE connection points for the +5V supply. On export versions, there may only be TWO connection points. They should be marked “VCC1”, “VCC2”, “VCC3” or “+5V” on the board. Wires going to these points are normally coloured red. Connect all of them together at the +5V terminal of the SMPSU. There should be ONE -5V connection point on the motherboard (marked “-5V”). The wire for this is normally coloured violet/purple. Connect this to the -5V terminal on the SMPSU. On most (U.K.) BBC computer motherboards, there are THREE connection points for the 0V/ground wires. On export versions, there may only be TWO connection points. They should be marked “0V” on the board. Wires going to these points are normally coloured black. Connect all of them together at the 0V/ground terminal of the SMPSU along with the green/yellow wire from earlier. Note that if the terminals on the SMPSU are not suitable for multiple wires to be terminated/connected. Then you will have to make the connections from the SMPSU to another more suitable connector. Then wire the multiple wires off from here. The wire connecting the SMPSU with these extra connectors should be rated for 3A minimum. All the DC output wiring going to the motherboard should be rated at 1A minimum if three wires are used for the +5V supply and three wires are used for the 0V/ground wiring. If only two wires are used, I suggest higher current wire, at least 1.5A. Last edited by 1024MAK on Tue Oct 23, 2018 11:14 am, edited 2 times in total. To clarify, the power supply has a proper ground/earth terminal so no problem there. First, I'd just like to clarify - I am to run a wire from the ground input terminal of the PSU to the 0v output (COM) of the PSU, correct? Can you just explain the purpose of this? Secondly, for attaching the PSU to the casing, I will need to install new spacers. Since the case is grounded, is there any reason I shouldn't use metal spacers? Maybe a silly question, but it's something that has always made me strangely nervous. Otherwise all the advice has made a lot of sense! Thanks heaps! Not sure I understand this one. Which instruction are you following? Are you saying you are going to run a wire from the mains to the output of the psu, not sure that make sense. Think I must be misunderstanding this one. Spacer I assume washers. If you are follwoing the instructions from the web site then it specifies metal washers/spacers. Are you concerned about using metal ones? In which case it isnt really relevant as the case, bolt etc are all metal anyway. And you want to keep contact good so you wouldnt want to use plastic. The wire linking the mains earth/ground to the DC output 0V/ground is to reproduce the electrical connections that are part of the original BBC PSU. This was likely a requirement from the BBC that Acorn had to meet. to prevent the DC output voltages of the PSU from floating to an unknown voltage with respect to mains earth/ground (with SMPSU type power supplies, the output voltage with respect to mains earth/ground can float to between ⅓ and ⅔ of the mains voltage, although this voltage is at a high impedance, so it can give you a shock, but is unlikely to injure you). Remember that the BBC computer has various exposed electrical contacts that are supposed to be only at a low voltage. to prevent a voltage difference causing problems when the BBC computer is connected to other equipment or peripherals. to reduce the amount of interference produced by the SMPSU and the digital electronics in the computer. this arrangement is considered to increase safety, as in the event of a failure of the transformer (or other part of the SMPSU) the DC output voltages will be limited as any fault current will be shunted to earth/ground, hopefully in the process blowing the mains fuse in the SMPSU or maybe if used in the UK, the fuse in the mains plug. Last edited by 1024MAK on Wed Oct 24, 2018 2:14 pm, edited 2 times in total. The Mean Well PT-65A has an earth connection on the PSU and I was under the impression comm was referenced to Earth as no instructions to do what you said for the Master on Simn's wiki page. But then there is the note about PT-65D only and not A, so not sure now. In the datasheet that you linked to, it only shows a capacitor between the DC 0V/ground/COM connection and chassis/mains earth/ground. There is no direct electrical connection between mains earth/ground and the DC 0V/ground/COM connection. It’s true that Simon’s web page showing his fitment of a Meanwell SMPSU in a Master does not include the earth/ground connection that I recommend. I don’t know if this was an oversight, or for some other reason. I forgot to answer the metal bracket question. I see no reason why metal brackets / supports should not be used. 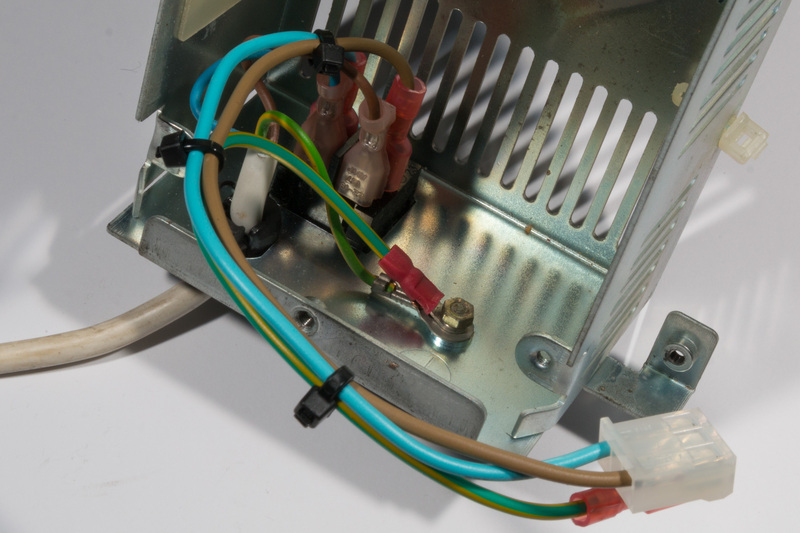 You should however ensure that any metal parts have a really good connection to mains earth/ground. If they are being bolted or screwed to metalwork that is already earthed/grounded, the use of star/crinkle washers should be used to ensure a good electrical connection. If a good electrical connection cannot be made this way, then you should run extra green/yellow earth wires as needed. Last edited by 1024MAK on Wed Oct 24, 2018 2:27 pm, edited 1 time in total. So is that not required on the Master? As no instructions for a direct connection on the Wiki page for this PSU on the Master. Maybe going slightly offtopic but if you tied the ground to reference Earth, then 0v is no longer isolated, so would that not cause potential issues when using a scope, or is that only an isuse if you are using non isloated stuff at 240v (or some other large voltage) ? I saw something about common being weakly referenced due to the caps, but I guess that is only really EMI as DC isnt going to get through a cap. Left to right the tracks are +12V (yellow wire), +5V (red wires and orange wire), 0V/GND (green wire, black wires) and -5V (blue wire, violet/purple wire). The green wire shown in the photo connects to the metal PSU case. At the other end of the case, the green/yellow wire from the mains lead also connects to the metalwork of the case. Last edited by 1024MAK on Wed Oct 24, 2018 5:32 pm, edited 1 time in total. As you can see from the following two photos, there is an electrical connection from the mains earth/ground pin on the mains plug to the computers 0V/GND system (conveniently accessible on the BNC video output socket). The Meanwell makes be earth referenced, just check master with Meanwell and same result as you. Edit: In case not obvious I should have mentioned this Master is equiped with the Mean Well PT-65A psu. Last edited by Elminster on Wed Oct 24, 2018 9:37 pm, edited 1 time in total. OK, I think that clears up my questions! The wire I am to add going from the front to the back of the PSU is, in short, to make it behave more like the original power supply for the computer. Everything else seems pretty logical and straightforward. You don’t need to add one, just follow the instructions for the master. It says earth the earth spade connnctor on the psu, that is where it comes from. The connector labelled E is the Earth that must be Earthing the 0v, as my Meanwell is Earthed with no extra wires beyond what it in Simon’s Meanwell instructions. Assuming Mark agrees with me. Last edited by Elminster on Wed Oct 24, 2018 10:44 pm, edited 2 times in total.